—Queen Elizabeth II (1926– ) Her Majesty’s reasoning when overruling her advisers, deciding that her coronation should be televised. The year 2006 was a very good one for playwright and screenplay writer Peter Morgan. His stage play Frost/Nixon opened at London’s Donmar Warehouse Theatre; and The Queen, his film about the Royal Family’s response to the death of Diana, Princess of Wales, was released. Its star, Dame Helen Mirren would win a Best Actress Oscar for her work in the title role. It is remarkable how much Dame Helen resembles Her Majesty. Dame Helen and Mr. Morgan have teamed up again, this time with a stage play titled, The Audience. Miss Mirren portrays Queen Elizabeth II flawlessly again; she does not impersonate the Queen but gives us a glimpse into the inner life of the monarch, revealing a human being beneath the crown. First produced in 2013, the play enjoyed a record-breaking run at London’s Gielgud Theater; Miss Mirren won the Olivier Award for Best Actress in a Play. The list of players portraying the prime ministers. This play is based on the weekly private audience given by the monarch to her prime minister over the course of her 60-year reign. No one knows what is discussed at these weekly tête-à-têtes because they go unrecorded in any form. This element of mystery grants Mr. Morgan broad poetic license to flesh out for dramatic purposes what takes place during these private audiences. An actor dressed as a Coldstream Guard stands sentry on stage at intermission. The play does not follow a linear timeline; but rather jumps back and forth through Her Majesty’s 60 years on the throne, showing the Queen dealing with nine of her 12 prime ministers, whom she refers to at one point as “the dirty dozen.” Mr. Morgan freely speculates about the discussions. Much of that imagining is very funny. He thinks that the Queen may have acted regularly as a stand-in for a therapist to her stressed-out ministers; she offers a handkerchief to a teary-eyed John Major and suggests that sleep and rest would help a sickly Gordon Brown. There are even two Corgis, the Queen’s favorite dog, who romp on stage during the course of the play. On the more serious side Morgan presents the Queen using her position to take the high ground when her ministers have more lowly personal, or even questionable legal reasons for their actions. In 1952, the recently ascended 24-year old Elizabeth points out to an aging Churchill the real reason he wants to delay her coronation. More than 30 years later she exposes a possible personal motive for Margaret Thatcher’s unwillingness to impose sanctions against South Africa. 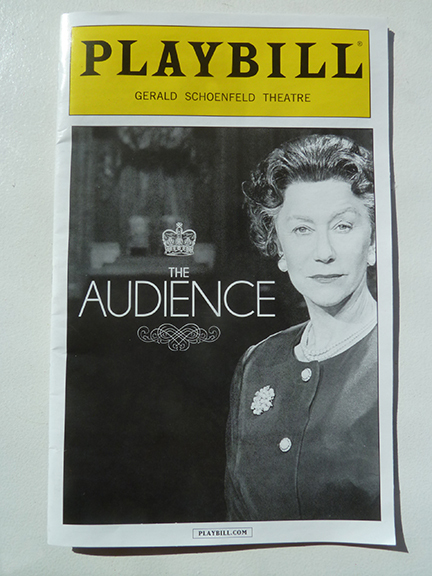 Scheduled to open on March 8th with a limited engagement through June 28 at the Gerald Schoenfeld Theatre, the play has the feeling of a string of sketches, tied together by Dame Helen’s enlightened performance, through which we see the Queen grow in confidence and authority. In several scenes the adult Elizabeth exchanges dialogue with a young actress portraying Lilibet, the name family members have called her since childhood. These exchanges give a real sense of the confinement and solitude that a life of royal privilege has.